posted: April 04, 2019 by: Dr. Plodzik Tags: "Clinic Specials" "News"
"Heartworm Prevention Benefits vs. Cost of Treatment"
Spring is here (although it may seem so far away on the days we have those blustery white out conditions in March)! When we think of spring, the thought of warmer temperatures, rain, beautiful flowers blooming and sunshine are some popular images that come to mind. With those warmer temperatures and rain comes other less popular but essential ecosystem changes. Mosquitoes. With the mosquitoes comes the increased risk that one of those mosquitoes will be carrying heartworm disease to your dog or even cat! When coming to visit us at SRAH you likely hear “do you need any heartworm or flea and tick prevention today?”. This question comes with the full weight of knowing that without prevention, damaging and sometimes deadly consequences can follow from heartworm disease transmission. What exactly are these “costs” to our pets? Well let’s consider the cost of heartworm prevention – here at SRAH we encourage the use of Heartgard (for heartworm AND intestinal parasite prevention), Sentinel (Heartworm AND intestinal parasite prevention) or Revolution (Heartworm and flea prevention). These three products if used monthly cost an average of $13 per month (for a medium sized dog) and sometimes less as promotional rebates are available. So for roughly less than $150 a year you can protect your dog from heartworm disease (and intestinal parasites and fleas even!). An annual heartworm test is always recommended as a missed dose of prevention (even by a few days) could mean infection so let’s also include that $45 test annually. So really we are looking at about $190 (or less depending on product used). The cost of not using heartworm prevention means a positive heartworm antigen test ($45) and then the recommended staging of how advanced the infection may be within the body. This testing includes complete bloodwork (about $130) along with potential chest radiographs (x-rays) which are another roughly $130 and then factor in the treatment for heartworm involving oral medications costing around $60 and then the initiation of treatment with multiple injections of a medication to kill the heartworms in the body. This medication is VERY costly and can carry some serious side effects but monetarily we typically see about a $800-$900 bill for this multiple day treatment. Then the follow up examinations, testing to ensure the infection was cleared etc. is all in addition to this cost. 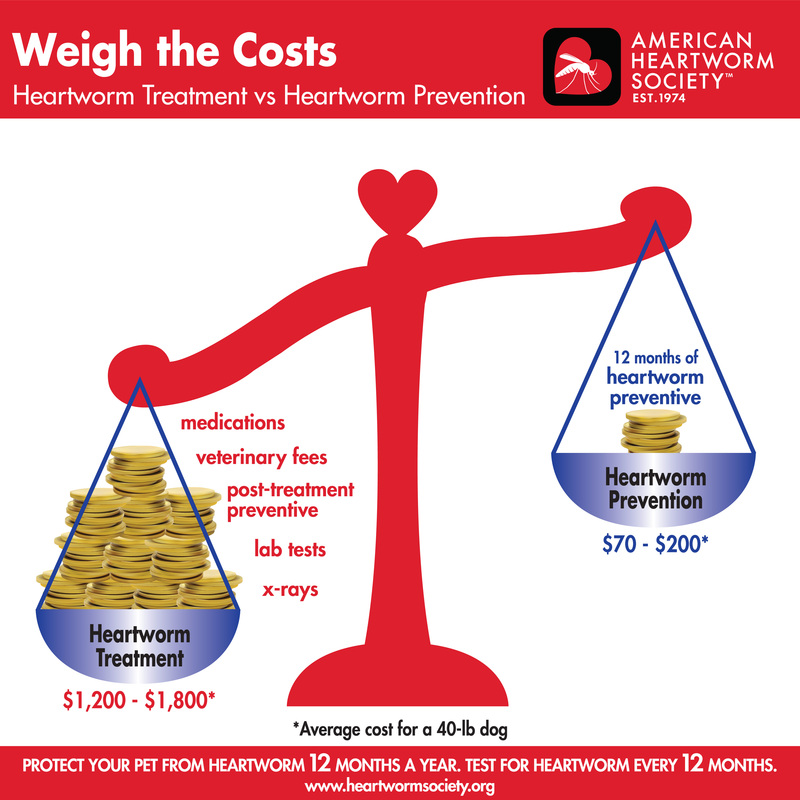 So overall the cost of treating a preventable heartworm infection averages between $1000 to over $1200! This is just the monetary cost to us owners, but to our pets, the cost to long term health can be detrimental to the heart, lungs and entire body, shortening their lifespan. So this spring, please consider protecting your pet with monthly heartworm prevention and let’s not risk gambling the cost of having to treat a heartworm infection.